In yet another setback for lithium-ion battery technology, Mitsubishi Motors has acknowledged that it recently had a fire and an overheating incident involving the high-energy batteries. The automaker reported early Wednesday that a lithium-ion battery pack intended for the Mitsubishi i-MiEV caught fire while connected to a charge/discharge testing station at a Mitsubishi plant in Okayama Prefecture. In a separate incident, a charged lithium-ion battery installed in an Outlander plug-in hybrid overheated, melting battery cells and part of the battery pack. ”A single one of the 80 cells within the battery pack was overheated, melting adjacent cells,” a Mitsubishi spokesman told Design News in an email. “The 80 cells within the battery pack are divided and set into ‘three blocks’ within the drive battery pack. Examination found that only one of the three blocks sustained any damage.” Batteries for both of the vehicles were manufactured by a joint venture involving Mitsubishi and GS Yuasa Corp., the company that made the batteries now being used in the Boeing 787 Dreamliner. GS Yuasa did not respond to calls or emails from Design News. ”It’s not clear if there are problems with the batteries from GS Yuasa,” Cosmin Laslau, an industry analyst for Lux Research Inc., told Design News. 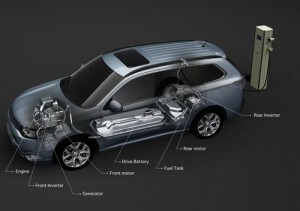 “But if they contain impurities or contaminants, that would be an issue.” The lithium-ion batteries used in the Mitsubishi Outlander, as well as the company’s i-MiEV electric car, are believed to use a different chemistry than those employed in the Boeing 787. Both vehicles are said to employ a lithium oxide manganese spinel (LMO) chemistry, whereas Boeing’s units use a more energetic lithium cobalt oxide (LCO) chemistry. Laslau told us that automakers typically use one of three different lithium-ion chemistries: lithium-iron phosphate (LFP), nickel manganese cobalt (NMC), and LMO. No automakers currently use the chemistry employed by Boeing. ”The auto industry is trying to decide between those three, and determine how they might mix them in a way that combines the best attributes,” Laslau said.